This unusual name derives from the Olde French "Soudan" (Arabic "sultan" a ruler) and was originally given as a nickname either to someone who behaved in an aristocratic manner or to one who played the part of a Sultan in a medieval pageant. The surname is first recorded in the early 13th Century, (see below). 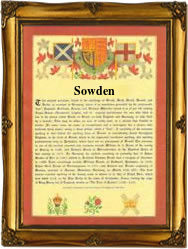 One, Robert le Sowden appears in the 1279, Hundred Rolls of Buckinghamshire. In the "modern" idiom, the name is spelt Sowden, Soden, Soltan, Soldan and Sultan. Susan Sowden was christened at St. Andrew's, Holborn, on the 28th October 1565, whilst Thomas Sowden married Katheren Saddeson in February 1669 at St. Dunstans, Stepney. The first recorded spelling of the family name is shown to be that of Roger le Soudan, which was dated 1208, in the Pipe Roll of Yorkshire, during the reign of King John, known as "Lackland", 1199 - 1216. Surnames became necessary when governments introduced personal taxation. In England this was known as Poll Tax. Throughout the centuries, surnames in every country have continued to "develop" often leading to astonishing variants of the original spelling.